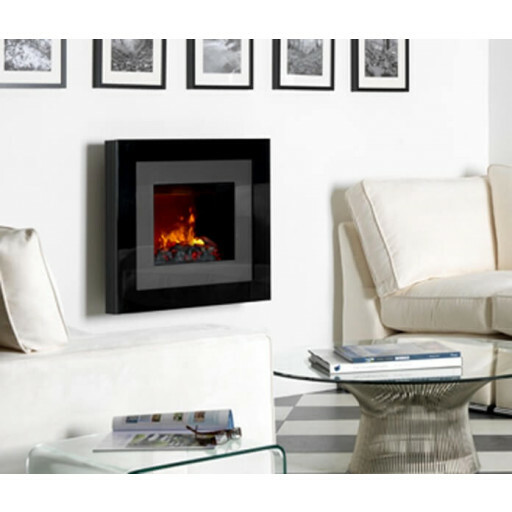 Dimplex Redway Opti-Myst wall hung electric fire is a sleek and streamlined electric fire that possesses a distinctly modern appearance. The electric fire is highly durable and sturdy as it was built utilising only the highest quality materials and tools available. Since this product has a very fresh appearance, it can make a suitable decorative component to the vast majority of residences. Its colour is black with elements of anthracite. One notable component of this wall-mounted fire is its attractive design, which is open fronted. This fire is also equipped with conveniences such as a remote control, a thermostat and quiet smoke and flame effect functioning. It has a 2kW fan heater provides users with the helpful option of a couple of different heat settings. This electric fire from Dimplex utilises the revolutionary Opti-Myst smoke effect technology that doesn't have to be employed exclusively alongside its heat function. If you're looking to invest in a cosy electric fire that's highly functional and at the same time beautiful in a modern, cool and stylish manner, then this Dimplex product may make a wonderful presence in your home. The effect on this electric fire is amazing. My friends all think it is a gas one it is that realistic. I would Highly recommend. I wanted a nice space saving focal point in my room and this fire fitted the bill. The flame effect is second to none. Very happy with our new electric wall hung fire,takes up minimal space and really modern looking with realistic smoke effect. The flames look the most realistic for an electric fire.